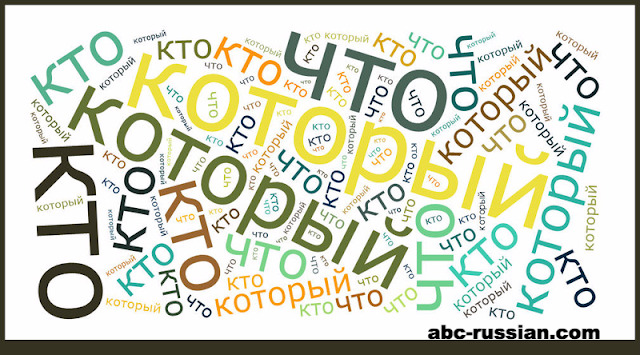 ABC Russian: What is the difference between КТО and КОТОРЫЙ? What is the difference between КТО and КОТОРЫЙ? Many students asked me the question: is there any rule about when you should use Russian relative pronoun который, vs pronouns кто or что? For example, it seems that in a phrase like "Девушка, с которой я вчера познакомился" you could easily replace it with "Девушка, с кем я вчера познакомился". Are both forms correct? There answer is NO. Is there a rule dictating when one should use который vs. кто/что? Yes, it is and let's discuss it. Yes, both these sentences look the same. Both have the same meaning. These words looks like synonyms in that meaning. Anyway there are some rules how to use который and кто. How to use Russian relative pronoun который, vs the pronouns кто or что? Кто should be used only with animate subjects. Что should be used only with inanimate subjects. Который - you can use both with animate and inanimate. There is the difference in usage only with animate subjects: you should use Russian relative pronoun который only with nouns and the pronoun кто only with pronouns. Тот, кто не опоздает, получит премию. Работник, который не опоздает, получит премию. Я видела кого-то, кто вчера был с тобой. Я видела парня, который вчера был с тобой. Если встретишь того, кому должен - верни деньги! Если встретишь человека, которому должен - верни деньги! Remember that Russian relative pronoun который introduces a sentence that modifies a noun. For this reason it has to agree in number and gender with the noun it modifies like adjectives. However, unlike regular adjectives, it does not agree with that noun in case; rather, it reflects the case of its function in the subordinate clause. Actually, который behaves like a conjunction, in that is conjoins a subordinate clause, and like a pronoun in that it agrees with some noun in the main clause as well as reflects the case of the subordinate clause in which it occurs. There is the girl whom I met yesterday. Notice that in formal English, we use the accusative whom to indicate that the relative pronoun who is the direct object of the subordinate clause. Since English does not have gender, and who does not express number, there is no agreement between whom and the word girl. In fact, we are free to substitute the more common conjunction "that" , for example: the girl that I met yesterday) or, indeed, omit the conjunction altogether, for example: the girl ____ I met yesterday. Russian is different in all these respects. In Russian you may use only который; you may neither substitute что or omit который. Thus, the sentence Вот девушка, с которой я вчера познакомился is the only translation of all the English variants in the preceding paragraph.